I've been kicking around the idea of building a fire pit. I've had a picture of one on my vision board for a few years now, but I'm almost ready to take it from a thought, to reality. It's almost like having a campfire in your back yard. In my mind, I can envision us having picking parties where we sit around the fire pit, swap songs and sip red wine. I began sketching ideas for designs and pricing the stonework it won't be cheap, even if I do the work, but it will be affordable. My carpenter is coming tomorrow to do a little finishing work on the barn that we left incomplete last year, so I'll get his thoughts on the fire pit too. Those are the best kind of parties... sitting, huddled, in a circle sharing stories around a fire. Toasting marshmallows. Ah! 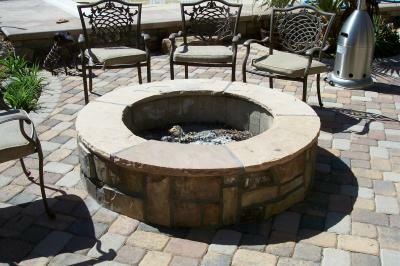 A fire pit sounds lovely. Nice :) And fun to hear that you're excited! I love fire pits, and my parents have one just like that. They did build it themselves (with help from Oldest) and it was a bit pricey, but it has given us many a good s'more. yeah, I definitely want a fire pit. just don't know where to put it yet. I think it sounds like a great idea! It's something we want to do as well. Next year - when the house is paid off - we plan to transform the patio into something we'll actually use. Fire pit included. I can't think of anything more inviting to friends and good conversation. Even though we are just about 3 weeks into fall we have still been able to joy the warm weather of summer, until night falls that is. As each day progresses the nights continue to get cooler.